Paul George opting out, will become unrestricted free agent. I don't think this is big news, I think he goes back to OKC, this is just a matter of procedure. 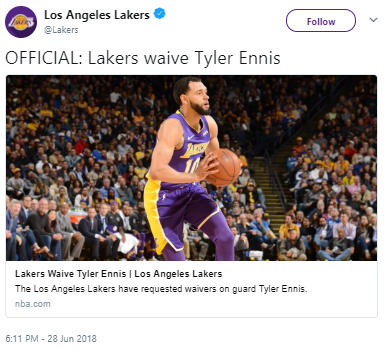 Still say he goes to the Lakers with James. 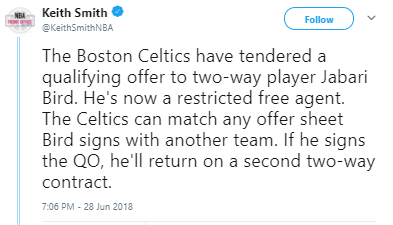 Yep, the QO is a two-way contract if the player is coming off a two-way and has played only one or two years with the team extending him the QO (I had thought it was 1 year as a 2-way, but when I went back and checked the rules yesterday it indicated it could be two years as well, so I’m not completely positive on the details, and it’s moot this year for all players). Once a player is no longer eligible for a 2-way QO, the QO is instead the minimum salary for his number of years of experience (which is 0 for players who’ve only ever signed two-way contracts). I’m hoping it’s a 2+2 contract near the minimum in year 1, same as Semi. I suppose this means there are rumours (however credible) Dolan is selling.